Santa Rosa Wall - One of the reasons Cozumel diving is so popular. Probably the most well known after Palancar. This is a great drift dive. The current is usually strong and you fly along the wall. We've traveled quite a distance each time we dove this wall. Exciting and fun! Because of the strong current, this site is for experienced divers. The wall starts at 50 feet and goes to the deep abyss. 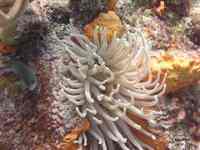 You'll find tunnels and caves, sponges, angelfish, rays, groupers and lots of other marine life. I did find one tunnel here to be a bit claustrophobic, so be aware and try and check out the tunnels before you go in if this is an issue for you. The deepest we went on this site was 85 feet, with 70 feet being about average. Unfortunately, the popularity of this site has its drawbacks too. Each time we went to Cozumel diving and have done this dive, there have been lots of divers. Worse yet, lots of inexperienced divers. This can be distracting (to say the least) and takes some of the pleasure out of the dive. But not enough to stop us from going back! Horseshoe - This is a interesting dive with some great formations. You'll find a series of coral heads in the shape of a horseshoe curve which rise to within 20 feet of the surface. We've seen barracuda, crabs, angelfish and drumfish, to name a few. The max depth we had on these dives was 75 feet, with 60 being average. 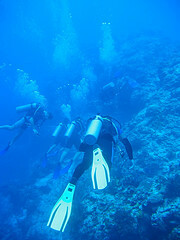 This is a good site for new divers to start their Cozumel diving experience. On one dive here, we lost 2 divers. They kept on hanging back and going off from the group. I kept on looking back for them because they were worrying me. We eventually found them - on another dive boat! Tormentos - Another good drift dive (You can read more about drift diving in Cozumel here). This site has lots of coral heads above a sandy bottom. You'll see beautiful fans and sponges on this dive. The max depth on our dives here was 63 feet, with 55 feet being about average. This site is an intermediate level dive. We've seen some great marine life on these dives - goat fish, toad fish, juvenile drumfish, grouper, eels, lobster, spiny starfish and lots more. On one dive, the divemaster held a puffer fish for the group to feel. Colombia Reef - Another great day of Cozumel diving. This is a beautiful drift dive a couple miles south of Palancar. The top of the reef is about 60-85 feet. You'll see canyons, ravines, huge coral pinnacles and more. We went through several swim throughs each time we dove here. This site is good for spotting bigger sea life such as turtles and big groupers. Our max depth on these dives was 82 feet with 70 being about average. This is a good intermediate dive. This are just a few of the great spots Cozumel has to offer. You can probably pick just about any of Cozumel's dive sites and have a fun and interesting dive. All places should be so good! So go, pick a site and have a great dive! Photos by neutralbuoyancy and the Herrera family. Thanks!